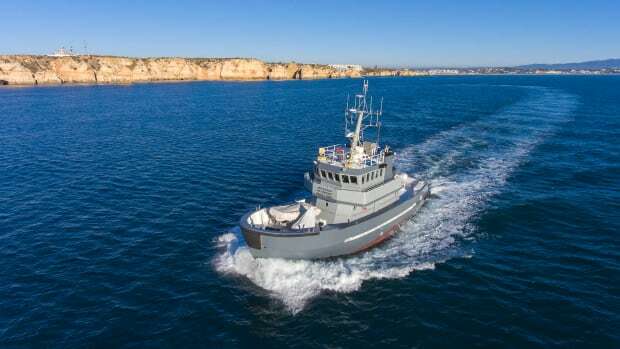 Steel is a boatbuilding material that you normally associate with ships, rugged workboats, and large superyachts. Without a doubt, composites in various forms rule the power cruising sector, though you can still find a few trawlers with aluminum hulls. Cut from a CNC router, interior parts await installation. Steel provides incredible strength for the hull’s longitudinal and transverse grid, shown here. The weight and construction method translate to a quiet, stable ride. Linssen builds and sells around 70 steel yachts every year, which would lead one to believe they must be doing something right. The process starts with clean, shot-blasted steel plates arriving at the factory gates. The thickness of steel used ranges between 4 and 6 millimeters depending on where it is used and the size of the yacht to which it is destined. Linssen cuts these steel plates to shape using a CNC plasma profiling machine. The computer is programmed to cut the steel shapes in a way that generates a minimum of waste. The level of accuracy is so high so that when it is assembled in the jigs, the fit is meant to be snug. Where possible, Linssen also introduces bending or folding of the steel to reduce the amount of welding needed, again, much like the principles found in car manufacturing. Linssen Yachts have maintained consistent, timeless appeal around the world, from the canals in Europe to the Great Loop and beyond. The next stage of construction involves wheel-mounted jigs that roll along a track recessed into the factory floor. First the hull plating is introduced and welded, then the stiffeners are added along with details, such as thruster tunnels and propeller apertures. 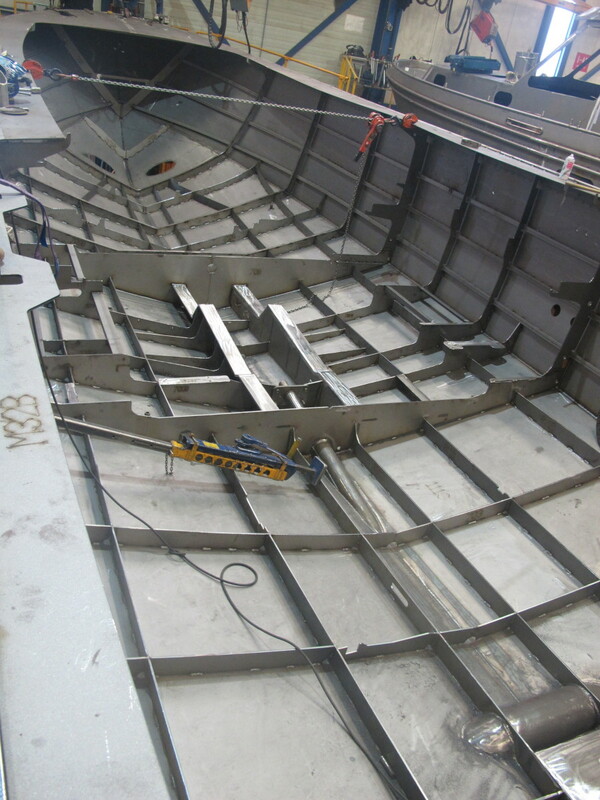 Alongside this hull construction, the decks and superstructures are assembled on a separate fabrication line, and welded in the same fashion. At the end of these lines the two units are joined together. 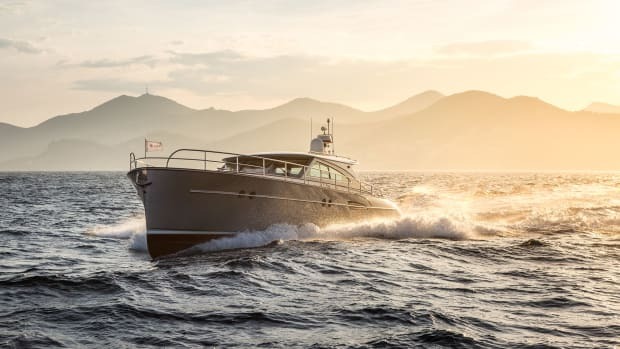 It is a simple, logical process that Linssen has down to a science: Each model takes roughly eight days to complete and there is one production line for the smaller yachts in the range and one for the larger ones. Each line is adaptable to accommodate the various sizes of yacht required. Linssen’s fabricators weld together steel parts that were cut with a CNC plasma cutter to exacting precision. The completed hull and superstructure roll off the end of the line and head for the preservation system. Here, the steel is shot-blasted inside and out to bring it up to a shiny new finish, after which the first coat of primer is applied in the temperature-controlled paint shop. This primer is the key to the preservation process, which then continues with filling to smooth the hull shape, sanding and then more paint, more filling, and more sanding. The superstructure waits to be joined to the hull. 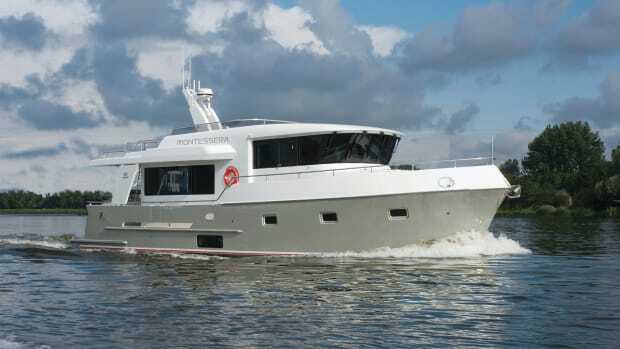 “The whole finishing process is carefully coordinated under controlled conditions to ensure the perfect yacht finish for which we are renowned,” Beelen said. From raw steel to gleaming finish and the structure now begins to look like a yacht. 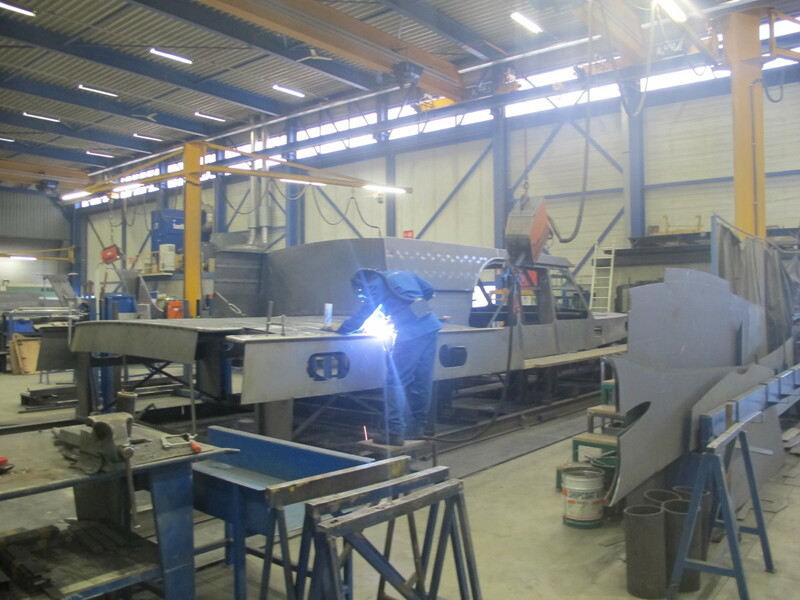 Now comes the fitting-out process and once more the hull joins a production line which is another Linssen Logicam flow system. All of the components for each boat are brought to the work stations as the yachts make their way slowly down the line. From start to finish, it takes another eight days to fit out the yacht with the engines, electricals, woodwork, and trim. Many of the yacht’s systems are produced outside the main factory. Linssen’s dedicated woodwork facility is located a couple of miles away, but the woodshop uses the same computer processing as the steel factory to produce accurately machined interior wood, which is delivered in sizes that can fit through openings in the steel superstructure. Electrical wiring harnesses come in packaged bundles for easy fitting and all the engine and fuel components can be coupled up directly. Linssen is dedicated to building high-quality, no frills yachts. The interiors are simple, clean, and functional, as shown here, but constructed to the highest standards. Each station in the Logicam hall is part of the flow system and is geared to cope with the special requirements of each particular model and each owner’s specification. 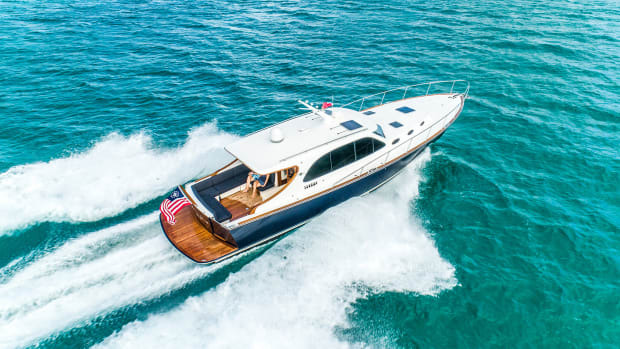 The finishing touch at the end of the line is the fitting of the necklace, the large natural rope rub rail around the hull that is at once practical and also the signature feature of Linssen yachts. 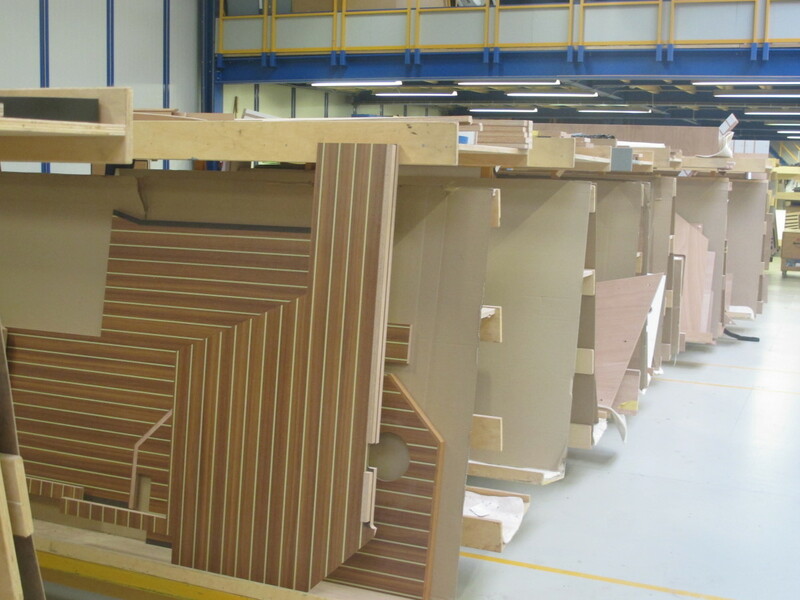 At the end of the fit-out period the completed boat rolls off the end of the production line and another takes its place at the beginning. However, don’t think that there is no flexibility in such a system—because there is space allocated to yachts that require special owner-request customizations. These yachts go through the basic production line and then are pulled off and finished in a dedicated shed so as not to hold up the production boats in line. You have to admire the efficiency of the whole process and it has taken a lot of design and development to get to this stage. The design details and forethought also make Linssens a dream for service. 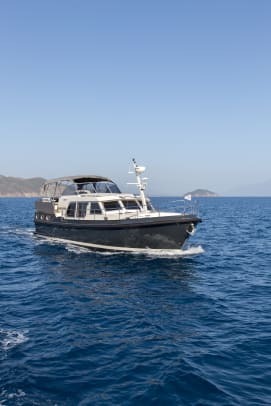 Linssen demands that designs must maintain fully accessible wiring and pipework well after the yacht is ready to set sail. So often with composite hulls you find that systems have been installed without allowing any access once the boat is finished unless you cut away bits of the structure. Linssen can trace its history back over 65 years when it was founded in Holland by Jac Linssen. 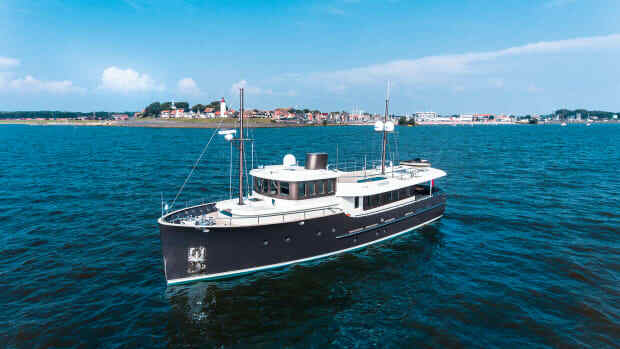 Linssen was a shipwright and the first non-workboats from the yard were built from wood in 1957. By 1967, the yard began building with steel. 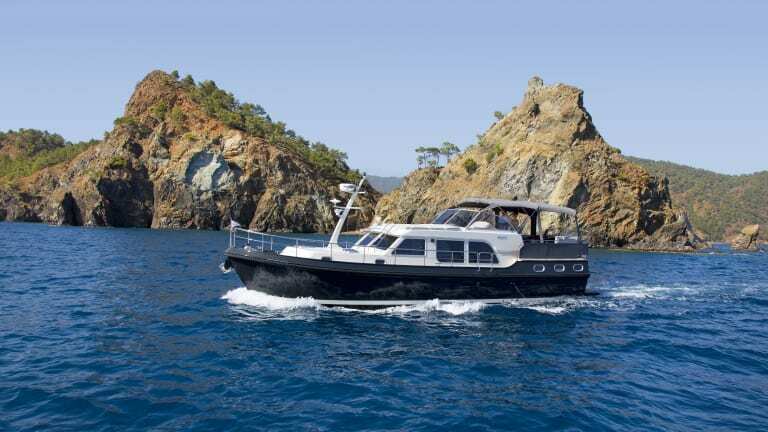 The present style of classic Linssen design started to emerge when the Sturdy range was introduced in the 1970s. It was the renowned SL Series designed by Jos Linssen, son of Jac, that put Linssen on the international stage and serious production in steel began. 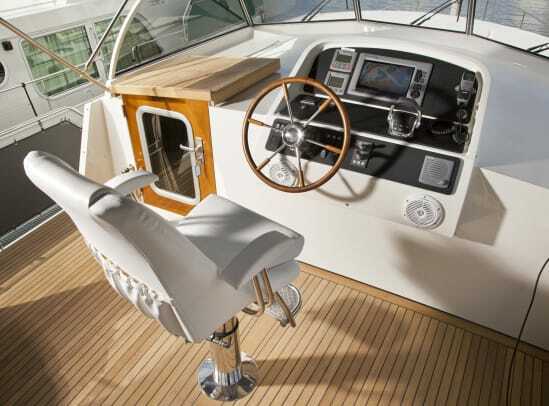 Innovation continued with expansion and the most visible design trademark was the Varitop, a fold-back canvas, Bimini-type roof that covered the flybridge control station. The Varitop can be opened in fair weather and sealed against the wind and rain when full protection is required. 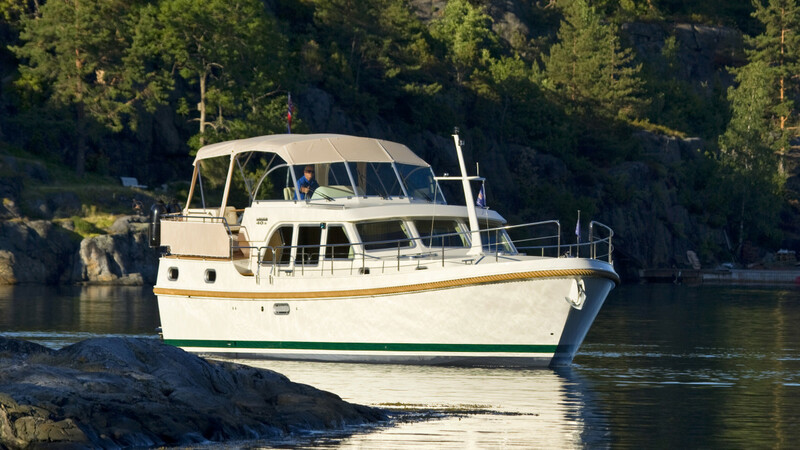 This is part of the philosophy of making Linssens year-round cruising yachts. Linssen’s lineage is clearly evident in the boat’s lines. The traditional Dutch scow bow is disappearing from modern designs, to be replaced by a hard chine hull that is both rugged and seaworthy. 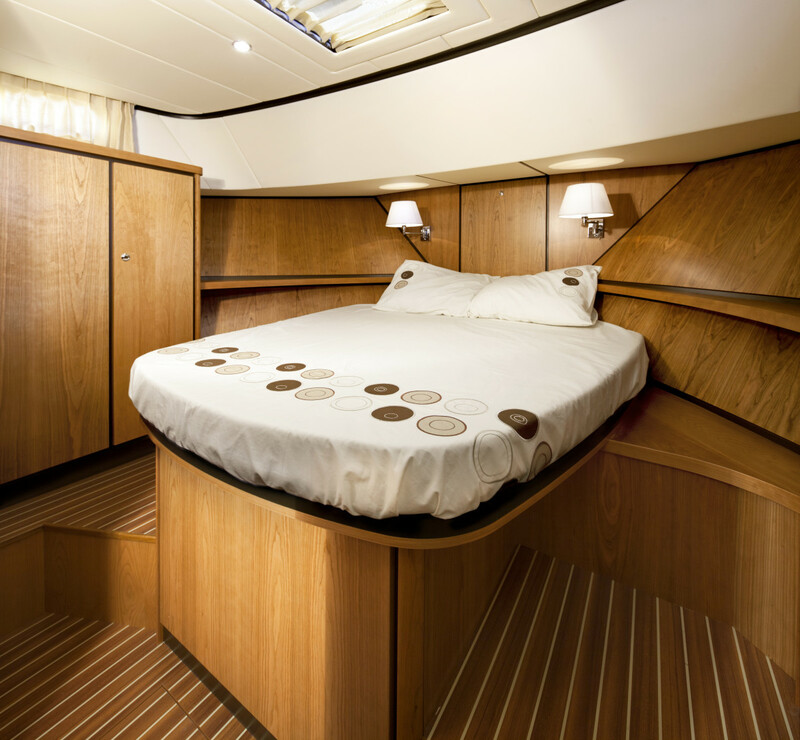 The Grand Sturdy range now extends up to 60 feet in a spacious three-cabin layout. 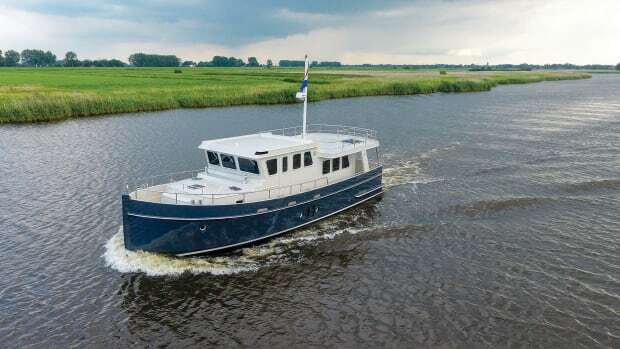 There is a vast range of options so a Linssen can be tailored to the buyer’s precise requirements, providing that he wants to cruise in a relaxing manner at less than 10 knots. The range starts at a little under 30 feet and extends up to double that, meaning they have something for just about everybody. On my visit to the Linssen production facility at Maasbracht near the Dutch border, shared with both Germany and Belgium, I got the chance to take a Linssen for a trial. This particular one was a few years old but I found myself rubbing my hand along the wonderfully smooth, perfect finish. Linssens look and feel solid underfoot as you step on board—none of that tipping feel you might get with a lighter boat. 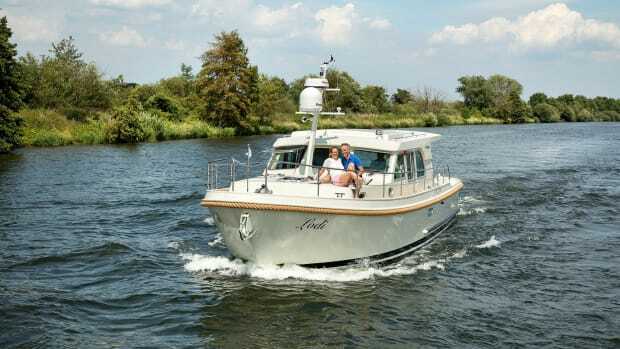 Cruising down the River Meuse, which runs past Linssen’s front door and which has connections to many parts of Europe, the overwhelming impression is how quiet the yacht is. On start-up you have to check the tachometer to make sure the engine is running. You could happily cruise all day at these sound levels, which are low enough to enable normal conversations. Due to the rugged, steel construction, there is also no vibration while running at any speed. 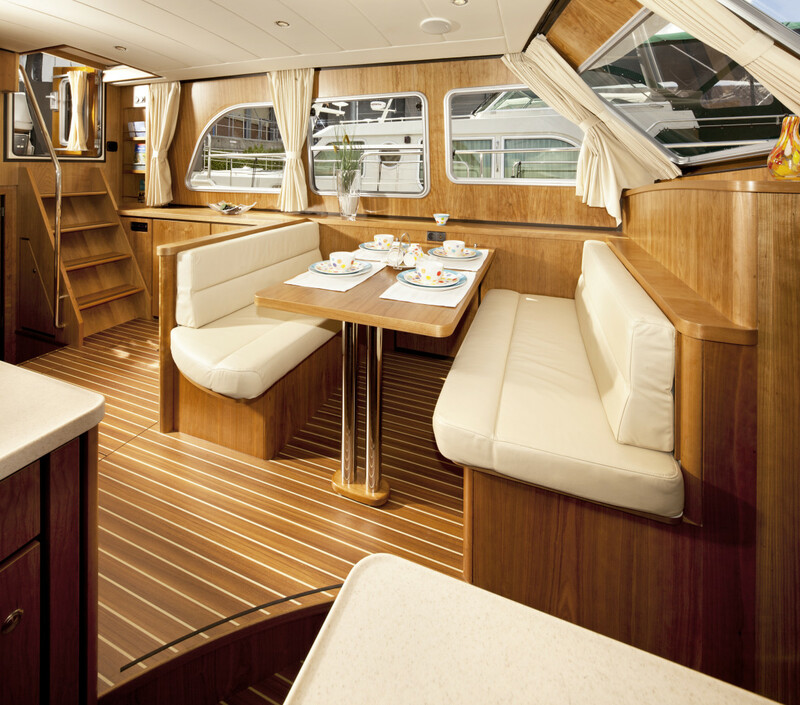 These features demonstrate the quality of Linssen and the company’s dedication to high-quality construction, noise attenuation, and first-class interior craftsmanship. 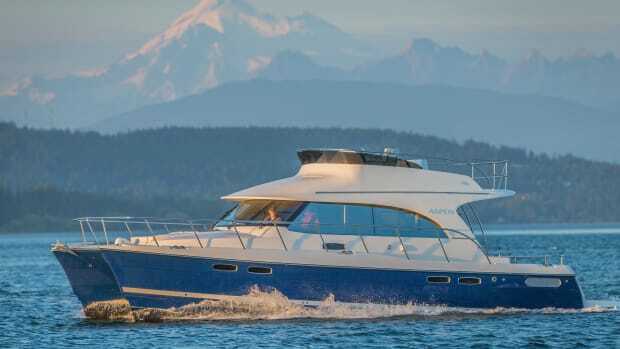 These sensible motor cruisers have evolved over the years into boats that will stand the test of time. 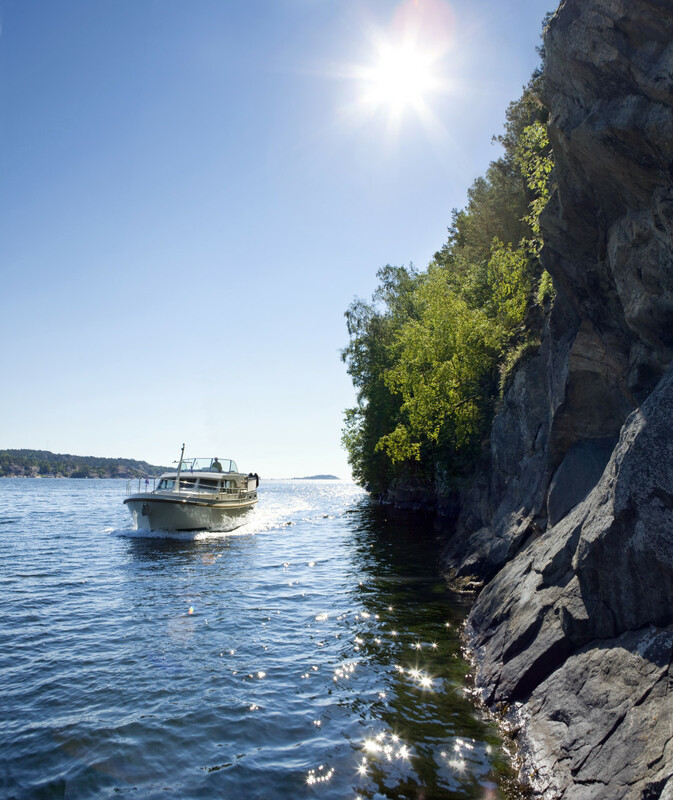 I love the solid feeling—that feeling of a boat that is built to last forever. 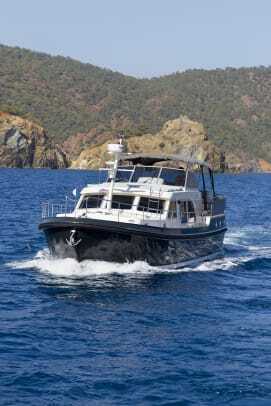 Steel is a wonderful boatbuilding material well worth consideration when chasing your dreamboat.